Here is a prayer card that you can print and save. The artwork is courtesy of Florentine master, Carmelo Puzzolo. The original painting hangs at St. James Parish in Medjugorje. A special prayer that has been a custom for generations in Medjugorje. 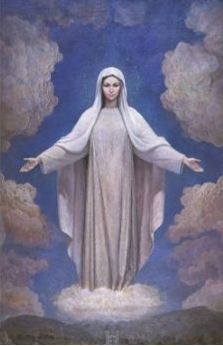 When Our Lady started to appear in Medjugorje she first asked the visionaries to pray the Peace Chaplet every day, and to add the Creed to the beginning. This chaplet is prayed every evening in Medjugorje immediately after evening Mass. Start with Sign of the Cross followed by the Creed. Then repeat an Our Father, Hail Mary, and Glory Be seven times.